Last night was a shocker. It really was… We are only just recovering now. We found poor Scooby, one of our beautiful palliative care dogs covered in blood with a puncture wound under her leg. We took her back to the emergency vet where she was given pain relief and made comfortable until we could assess her injuries. 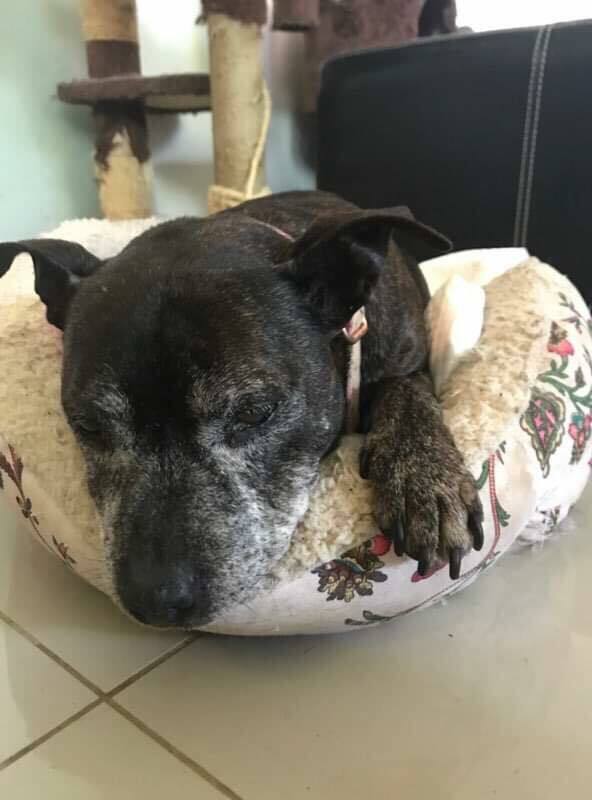 It was 1am when we were given the news that she would require surgery, something that made my heart drop and burst into tears.. Scooby came into QSAR at the ripe old age of 11 after being listed as “free to good home” on Gumtree. In the first 11 years of her live she was treated as a lawn ornament and only taken to see a vet once. When this darling old lady came into our care she was skinny, had a mouth full on rotten teeth and covered head to toe in nasty lumps. It took a very dramatic, 2 hour surgery to remove her lumps and fix her teeth, during surgery she wouldn’t regulate her breathing so the amazing vet nurses had to breathe for her, a both physical and emotionally exhausting task. When it was time to wake up she had a bad reaction to the sedation and crashed, she wasn’t breathing and started to turn blue, but thankfully the amazing vet team managed to pull her through! She then spent whole night vomiting, at one stage I looked into her eyes and thought we were going to lose her. Thankfully Scooby is a fighter and made a full recovery from her previous surgery but hearing the news that she would need to go under anaesthetic again was something we never wanted to hear. The decision was made that even though the risk was high, she required surgery to fix the wound and we had faith in the team at Animal Emergency Services. At 6am we spoke to the vets and found out that her surgery went well, that she was stable the entire time and that she would be able to come home at 10:30am. The good news is that it looks like Scooby is on the road to recovery – it will still take some time for her to get back to normal. Unfortunately, however, the vet bills have mounted from poor Scooby and this emergency visit. I’m staring at a vet bill for over $2,300 and to be honest we don’t have the money left in our bank account for this. I’m counting on you all tonight to dig deep and help us pay this bill. Scooby has shown tremendous fight and we need to do the same. Just $5 from each of you would get us over the line. The cost of your money coffee tomorrow morning. Please dig deep. Let’s do this for SCOOBY! It looks like you re already over the line with the target, if so put this money towards whatever else needs doing. Thanks for your ongoing support of these beautiful animals. I wish there was more I could do to help.